Dubai Parks and Resorts project is 35 percent complete and is on track to open October 2016. Rides are scheduled to arrive in 2015. The funding has been complete with the ipo that was done last month. The first phase to open will feature 73 rides in 3 areas. Sources say 95 percent of the rides have been ordered and 55 percent of the contracts to develop the park have been awarded. Marriott is set to operate the 503 room Polynesian themes hotel. 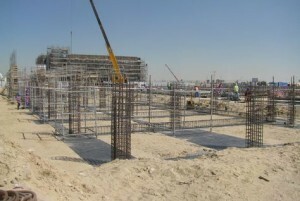 The hotel is scheduled to open in 2016 as part of the Dubai parks and resorts complex. New Details about Dubai’s Mega Theme Park Area. Dubai’s Dubai Parks and Resorts just announced a deal with Sony Pictures to bring a Sony Studios and Smurf Zone too complex to the resort. The new zones are set to open in the Motiongate park that is under development. The parks are set to included 12 attractions from movies including Cloudy with a Chance of Meatballs, Hotel Transylvania, Ghostbusters, The Green Hornet, Underworld, Zombieland, and The Smurfs. Park CEO Raed Al Nuaimi was pleased with the quality of movies and characters they will be able to add with the announcement of the deal with Sony Pictures. Currently the park is set to open in 2016 with the first three zones of the 4 million square feet at an estimated cost of Dhs10 billion.